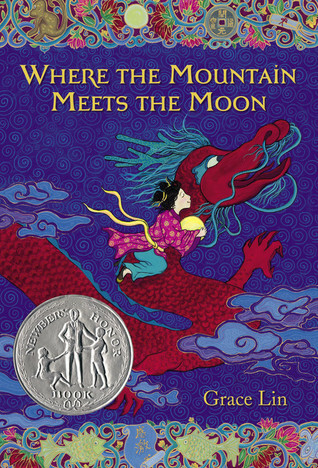 The book I read was Where the Mountain Meets the Moon by Grace Lin. The story takes place in a poor village in China. The book is about a little girl named Minli, a VERY courageous girl. Minli believes in many stories that her dad (ba) tells her. So, Minli goes to a place that was in one of her dad's stories and makes a wish. On her journey she makes many friends . I would recommend this to an adventure, fantasy or fairy tale reader. This book reminds me of when I go to my grandma's house (she lives in the country), every day is an adventure. I loved this book because I am an adventure reader and I also just love the author, Grace Lin.